Hello guys! I am new to the NSMBhd website, but not new to hacking, as I have been doing it for some time. Yet, at the same time, I wouldn't consider myself a "pro". I started this hack about a year ago and just continued adding to it slowly. 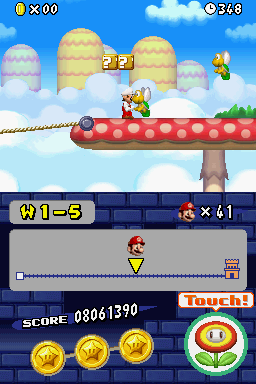 As Newer SMB DS was released, I started pondering about a crossover. The hack has it's title from being exactly as it sounds. "New-ISH"
It's almost finished, and I am taking my time with it so I can make sure that the finished product will be pretty good. 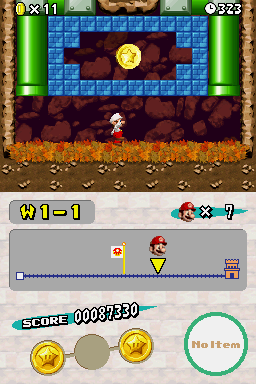 The hack is about being in the middle of both the original SMB DS, and Newer. It's basically a combination of the games. 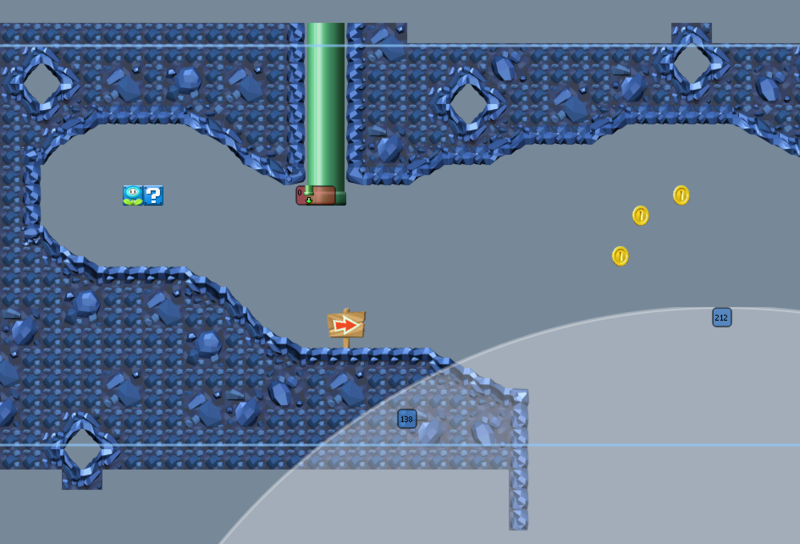 I imported some custom tilesets, such as Ice Tower from the Wii, and Volcano Outside from the Wii. 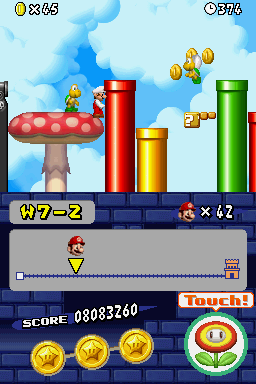 The game has Newer DS music, custom Logo, and I inverted the colors of some on the Bitmaps. 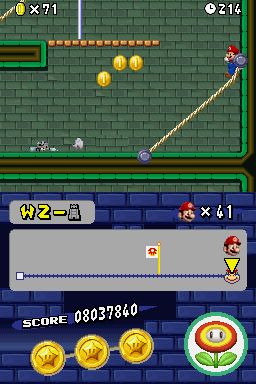 One thing I will not appreciate is that none of the boss battles (Except World 1 Tower and World 8 Final) will have sound due to the background's code. I will attempt to fix that later. So for right now, I left it as the first tower, you get victory music as your "first victory battle". I do have some screenshots on what the hack will look like, so scroll down. I expect that the hack will be released sometime in May, but no release date since I don't want to rush it. None of the Map textures or objects will be changed, and the coin/block/pole will remain the original. There's no ASM hacks in this game either, but maybe in the future. If there's any comments or questions, any recommendations, feel free to post them here! Mario has a staring contest lol. Thanks for reading, and I am very excited!! 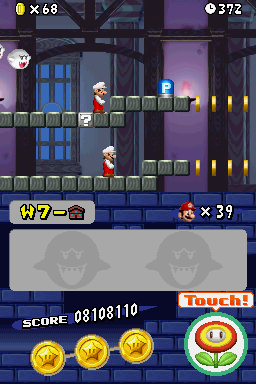 The truth about New Super Mario Bros. DS is that Nintendo could've done a much better job on graphics, code, and level design. And when New Super Mario Bros. U released, it was one of the most understandable games with really great level designs. 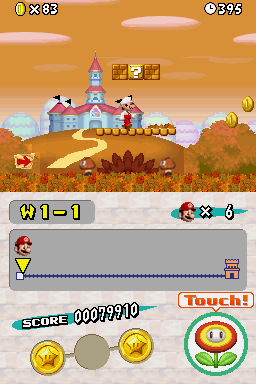 So without further ado, here is New Super Mario Bros. U on the Nintendo DS! This is not a remake. New Super Mario Bros. U was made for the more modern Wii U console. The DS doesn't have as many abilities and sprites as the Wii U does. Nevertheless, this hack is still cool to check out! -All new Wii U graphics, custom tilesets, and more! -Painted Swamplands and Airships make a comeback! -Wii U themed level intros! -New ideas to an old classic! -Retextured enemies, world maps, and more! -New MvL stages for you and a buddy! 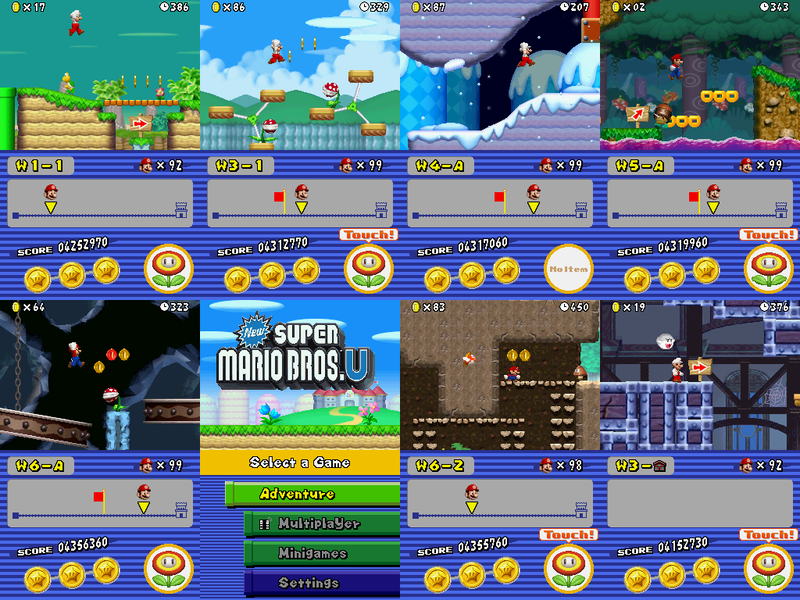 -Play as Mario or Luigi! Soundtrack is not available. Check back by again soon! await, along with several fancy tilesets, backdrops, music and more! Since the project is still in it's early stages, it doesn't have much to provide for screenshots. 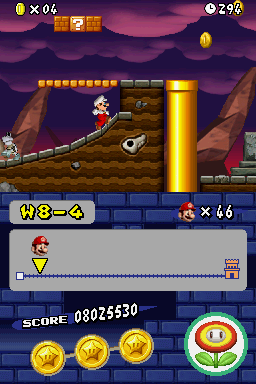 This hack is a 1 world hack and provides 8 new levels, including new MvsL stages as well! And here's the cool part; The rest of the original game is still completely playable! the new MvsL stages with a friend! Disclaimer:Even though it says how many levels are done, some levels may get deleted and redone for top quality and fun level gameplay. As of 11/20/18,Super Mario Fall Fiesta is no longer being worked on. I have no time for it. NSMBU needs all the attention I can give it. I'll keep the ROM and maybe release whatever levels are done, but for now, it's cancelled. Thank you for your support. Many hackers don't understand how pipes are done. I for one was once one of you, but after hours of trying, I taught myself how to do them. So here is the full guide to doing pipes! These are pretty simple in reality. Let's get started! 1. First, put down a simple pipe anywhere you want. 2. Go to the entrance tab and click "New entrance", then a "normal" entrance will appear on your screen. 3. In your entrance settings, click the drop down menu, and set it to the setting your pipe is! Example: If you have a pipe facing left, then click "Pipe facing left"
4. Now, go to your 2nd Area. do exactly what you did in the first three steps in Area 2, then go back to Area 1. 5. Now in the pipe entrance settings in Area 1, Make the destination Area "2". If your pipe is going to Area 3, then type 3 instead. 6. Next, type the view your entrance is in. Example: if your entrance is in view 1, then type "view 1" in view. 7. Next, type the destination entrance ID. Example: The entrance ID in area 1 is 7, and the entrance ID in area 2 is 8. Set the destination entrance to 8 on entrance 7. 8. Now go to area 2. All you need to do in the entrance there is the view. Type in the view it's in, (step 6) and then check "Exit Only (Pipes and Doors only)"
Now let's move on the having pipes in the same area. 1. Make your pipes in the same area. Example: One in View 0 and the second in view 1. Then add your entrances onto the pipes like last time. 2. Now set the desination entrance ID on the first entrance like last time. Set the view, and check "Exit Only (Pipes and Doors only) on the 2nd entrance. Basically, do everything you did last time except leave the destination area 0. 3. That should be it! Now let's move onto the last pipe! These pipes are a bit more tricky. 1. Make your pipe and entrances. Pretty simple so far. 2. Go to the path tab and select "New Path"
3. Drag the path onto the right tile of the first entrance. Then, click the "+" on the path to add a node. Drag the 2nd node to the other entrance. If your pipe bends, then add a 3rd node, and put it on the corner where the pipe turns. 4. Now set the destination entrance ID on the first entrance. Set the view too! 5. Now check "Connected Pipe" on both entrances. If you wish for it to be one-way, check "Exit Only (Pipes and Doors only) on the 2nd entrance. 6. Make a connected pipe ID. 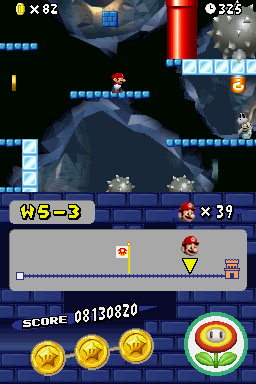 Example: Entrance 1: Connected Pipe ID: 6. Entrance 2: Connected Pipe ID: 6. 7: Change the Path ID to the same as the connected pipe ID. Also, if you don't understand this, look at 7-A to see how the pipes there are set! And that's it! If there's any questions or you don't understand a step, please comment! Why would you post something like this?! This is so innapropriate. You're going to get banned for that! 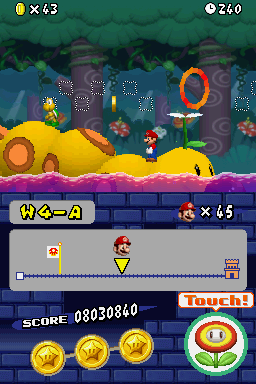 This Mario adventure is the Original NSMB and Newer Combined! 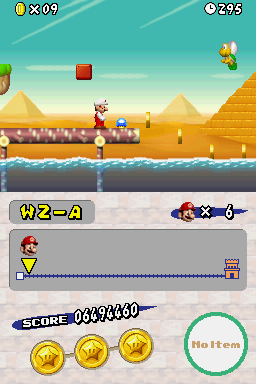 You will need Xdelta to patch an original NSMB ROM. I will not tell you where to get one since it's illegal. You will also need Desmume (DS Emulator) to play the game. To play it on a 3DS, you will need TWLoader or an R4 Card. Posted on 05-10-18, 12:26 am in Retextured Spike Sprite! I have successfully retextured the Snow Spike into a regular spike! The snowball is still a snowball, as this is in early development. 2. Go to Rom File Browser. 5. Find "gabon" and double click it. A window with the graphics of the Snow Spike will appear. 6. Click "Import PNG and recreate pallete". 7. Click on the download spike png you downloaded. 9. Close everything in NSMBe, and open Desmume. 10. And there you go! You may not believe it, but I and TheUnknown are the same exact person, I made another account because I was banned. Sorry Nintendo, but the ROM downloads are in another website. Y'know the secret project? Not a secret anymore! Introducing New Super Mario Bros. Wii Adventure! 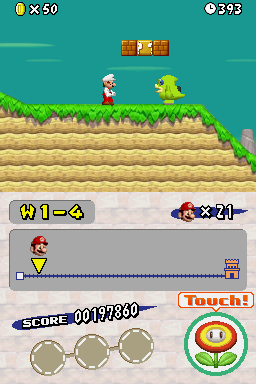 This is going to be a full NSMBW hack using the original game, and not newer. It will have retextured maps, new levels, and new graphics. I also already got a couple custom music tracks. 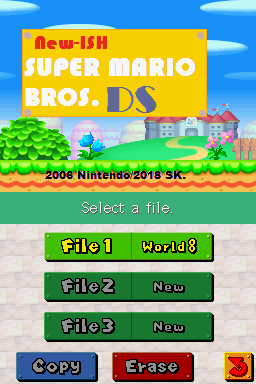 NSMBU DS is also still heavily being worked on, so don't expect much from this at first. I've seen a lot of users asking questions about this and getting very confused. Fear not! I will aid you with this helpful step-step simple tutorial. Unzip the file into a folder, and launch the application in it. This should pop up. Click on "Help" then "How to use this editor?" Another window should pop up with step by step directions. At the bottom of this Window, you'll see a "Save Template as PNG" button. Click it to save the logo template. The logo I'll be using already has a transparent background. Make sure yours is too. One way to do that without spending money on another image editor is going to Lunapic.com. It's an online image editor that you can click on a color and that color turns transparent. Paint the background of your logo a color that it's not actually using though. Now, click the section tool and crop the logo from the backdrop. Windows paint users, make sure that you have "transparent background" selected on the freeform crop. After cutting it out, right click the logo and click "Copy" and Paste it over the the template photo that we opened in another image editor earlier. Make sure that you resize it into the green area. Any part outside of it will not show up. You can also put copyright text in the red box too if you so desire. Save as outsource PNG, and the image will look weird after you save it, not color wise, but shape wise. It's suppose to look like that, so don't freak out. A window will pop up. Keep that window open, and go back to the uiStudio to find the palette. The palette is: UI_O_menu_title_logo_o_u_ncl.bin. Double click and Palette viewer will pop up. Click "Add All" and on the 2D Texture Editor, the game's logo should appear. Lower the tile width from 32 to 8 and click "Import this bitmap and recreate palette." Find your logo that you exported from the Titlescreen Editor earlier and click on it. Do this for the other 3 palettes too. After all that, click save and close the 2D Texture Editor. Now open your rom in DeSmuMe, and see how it looks! Hope this will help some of you out there! Thanks! Also, I stated that you can use any image editor. I just used paint because it's what I used before. Welcome Shoppers! 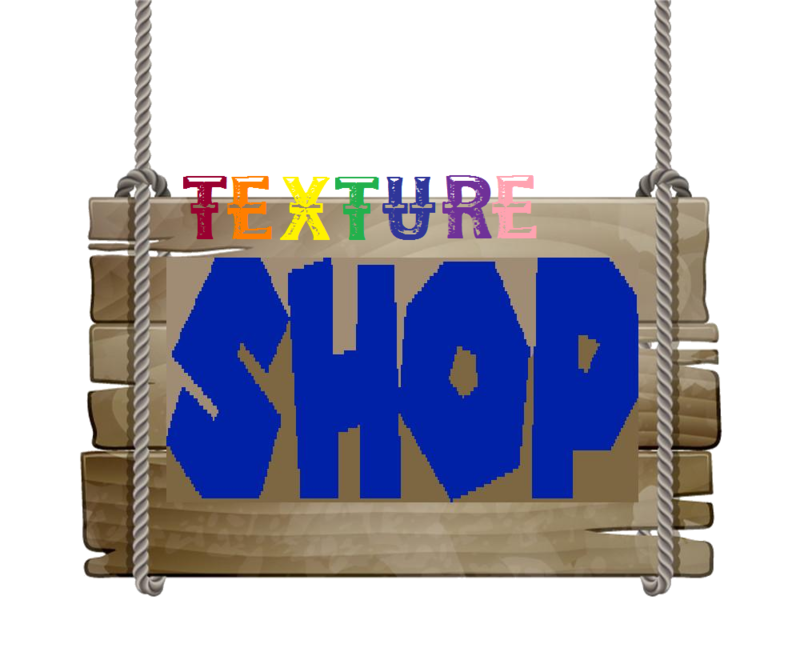 This is the Texture Shop! The place where you can browse sprite textures for your hack! Similiar to the logo shop, but with textures. I will texture almost anything upon request. Any sprite, screen, HUD Icon, you name it! You can also upload your own content here! I will! Everything I post for download is free to use and I would recommend adding credit, but you dont have to. So, anyone need anything? Ask down below. 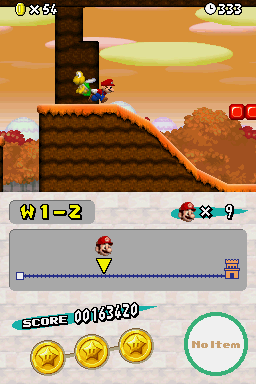 NSMBU Ground Swell Sprite. Replaces I_suna.nsbtx. Thanks for the awesome question and comment! I actually started hacking by just fooling around. 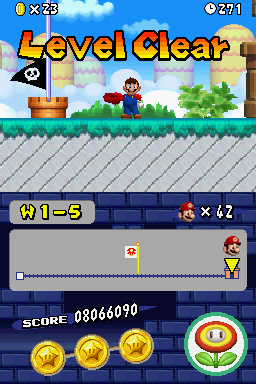 I heard you could hack mario and so I just played with the editor. 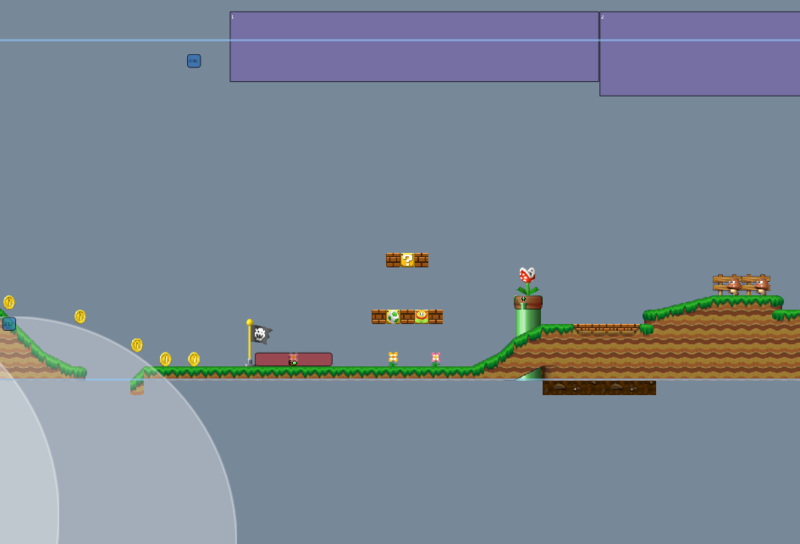 After a while, I started making custom levels, and then when Newer came out, that's when I got the idea. 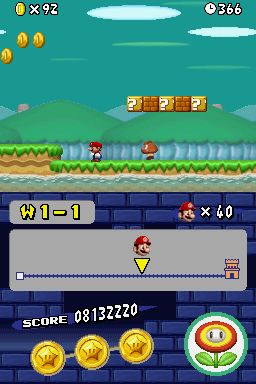 The hack is the original New SMB DS ROM. I will update the game's status with a new thread soon with provided screenshots! As a matter of fact, I just finished a level today! 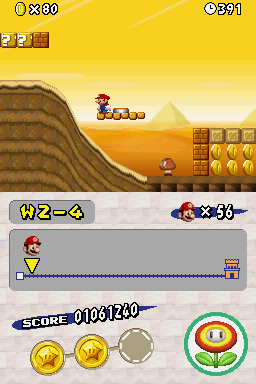 I do have a video of one of the levels, 6-A, is a desert themed level. I had to speed it up with a video editor due to such lag on DesMume. On another note, this is a link to the video, but this video is before I speeded it up, so it's really laggy. 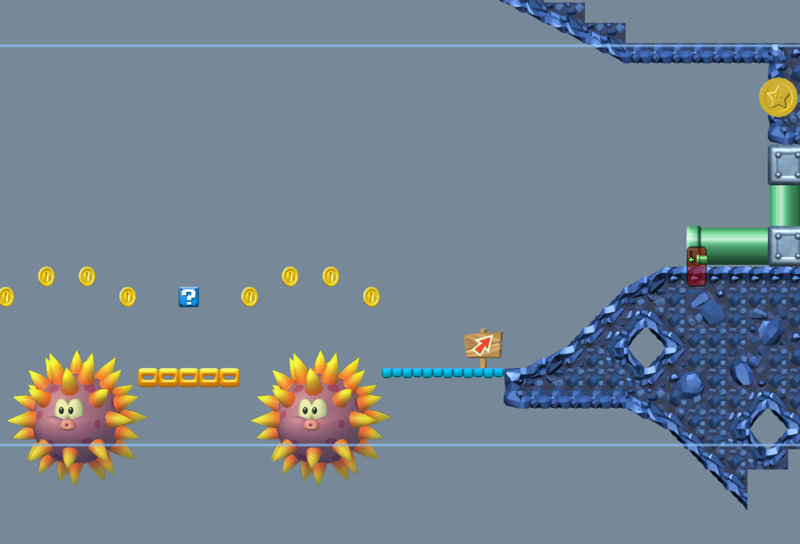 But you can see the whole layout of the level. All 3 starcoins are shown, so spoilers! For the record. No. I do not have a youtube channel. Don't ask why. 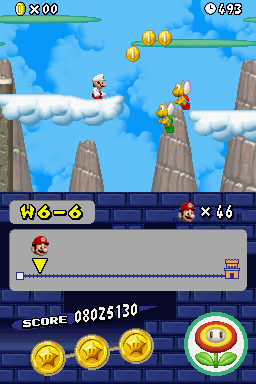 The hack also includes a couple of remake levels from NSMB Wii and NSMB 2. I will not tell you which levels because spoilers. Just look out for them though when it's finished! I also had a journal the whole entire way. I wrote every single level down as a list and crossed them off. One by one! Anyway, thanks for the comment and questions, and enjoy the video! The clones you see are exclusive to that haunted house stage. I played Clone Tag Team and thought it would be a good idea to include that as a haunted house gimmick. It's really difficult as avoiding certain death and it's also a puzzle. 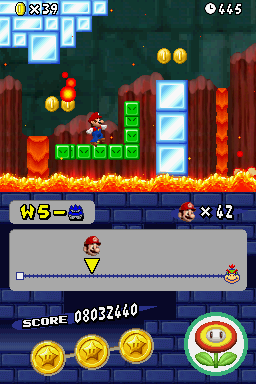 And world 4 and 7 will have to be unlocked normally with mini mario. I will! 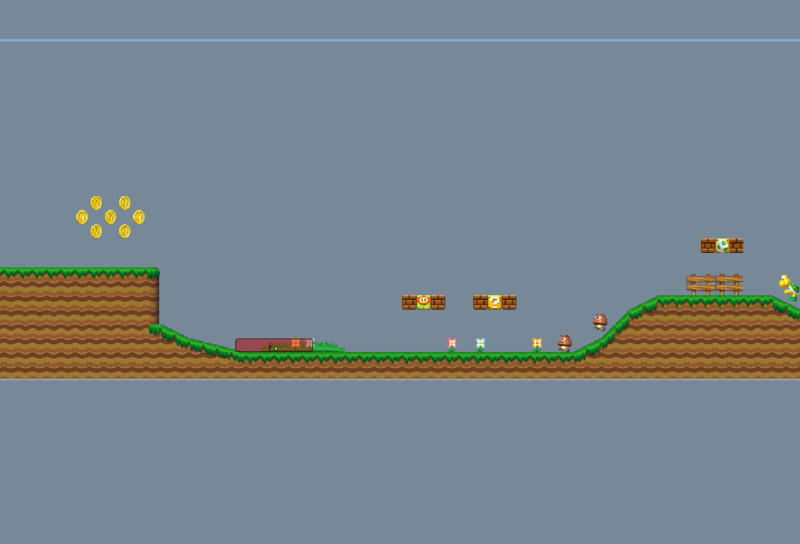 The levels are already finished but I will add them to the course.